IIT KGP VGSOM MBA Admission 2019 is done on the basis of CAT percentile. The IIT KGP VGSOM MBA Application Form 2019 was released by Vinod Gupta School of Management (VGSOM), Indian Institute of Technology (IIT) Kharagpur. The candidates were able to apply for MBA Admission 2019 online, on www.som.iitkgp.ernet.in. The last date to apply was January 30, 2019. The applicants will be shortlisted according to some specified criteria. The shortlisted candidates will have to go through the Written Analysis Test and Personal Interview (WAT-PI). Then, on the basis of the performance in all the rounds, the final selection will be done. The international students will be selected on the basis of WAT-PI marks and performance in GMAT. Interested candidates can check complete details about IIT KGP VGSOM MBA Admission 2019 from this page. Latest: Shortlist for WAT-PI was released on February 14, 2019. Scroll down and check the application portal to know the application status. 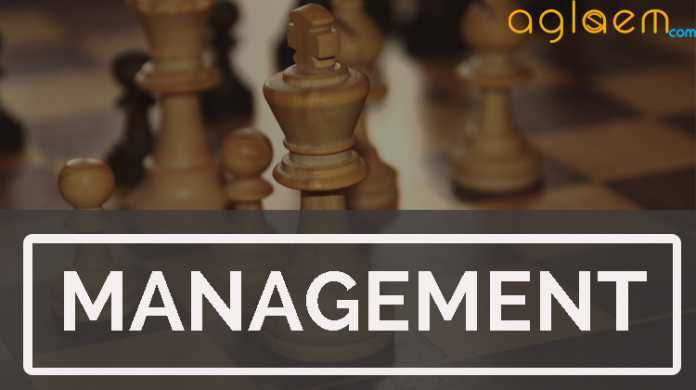 IIT KGP VGSOM MBA Admission 2019 is the programme for the candidates who are interested in the Masters of Business Administration (MBA). The important dates to apply for IIT MBA 2019 are given below. The candidates are advised to go through the entire page for more information regarding the IIT KGP VGSOM MBA 2019. *Note: The candidates belonging to the EWS category are required to submit a copy the EWS certificate in the prescribed format to [email protected] latest by 10-04-2019 (Wednesday) EOD. Shortlist for WAT-PI was released on February 14, 2019. The candidates are shortlisted for WAT-PI as per the criteria. The shortlisted candidates will go through the written analysis test and personal interview. The candidates who will score well in WAT-PI and will satisfy the other selection criteria, they will be selected finally. Candidates can able to check their shortlisting status for WAT-PI from the link provided below. Shortlisted Candidates: Click here to check the application portal to know the status of your application. Online Application for IIT KGP VGSOM MBA Admission 2019 has been started. Candidates can apply. Application Fee: The IIT KGP VGSOM MBA Application fee has been declared. The Application Fee for the General & NC-OBC candidates is Rs. 1600/- and the application fee for the SC/ST/PwD candidates is Rs. 800/-. The candidates should have scored aggregate marks in all years of qualifying degree or in the final year or final two semesters in the qualifying degree. Gen / NC-OBC: Minimum of 60% marks (or CGPA of 6.5 on a 10 point scale). SC / ST / PwD: Minimum of 55% marks (or CGPA of 6.0 on a 10 point scale). 2. Admission to reserved category candidates will be specified according to the government rules. 3. Any kind of inconsistency in the Medical Report, the decision of Institute medical Officer will be final. 4. For the candidates with some physical disability, the decision of Institute medical Officer will be final. 5. The candidates who are qualifying any degree examination and their result are pending then the candidate must have all the documents before the specified date. 6. Candidates who appear for the final year of bachelor’s degree/equivalent qualification examination and those who have completed degree requirements and are waiting for results can also apply. However, if selected, the admission of such candidates for the program will be provisional, only if (s)he submits a latest certificate by June 30, 2019 provided by the competent authorities of his/her university/college/institute (issued on or before June 30, 2019) stating that the candidate has completed all the requirements for obtaining the bachelor’s degree/equivalent qualification on the date of issue of the certificate. How to apply for IIT KGP VGSOM MBA 2019? The candidates have to follow the steps given below to fill the application form. First, the candidate will have to register on the link given. The candidates will have to register with the help of their date of birth (year, month, day). Then the candidate will have to click on “Information Pertaining to Online Application Process”. He/She will have to read all the instructions carefully before logging in. The candidates are advised to go through the entire instructions to make sure that they have all the documents required for applying. Now the candidate will have to log in with the login id and password. Fill all the details specified in the application form like personal, educational etc. Make payment of the application fee mentioned above with debit card/ credit card/ net banking. Now the candidates are advised to take the print out of the confirmation page for the future reference. There are two categories for the selection process. The first category is domestic students and the second category is international students. The selection process will be held in two steps. The candidate who will have to fulfill the eligibility criteria. The candidates will be selected for WAT-PI by the overall CAT score out of 20 and Application rating out of 20. They should have the cut-off in CAT equal to or above the following table. The Application Rating will be decided by the marks obtained in 10th, 12th, Bachelor’s degree, Master’s Degree and Candidate’s work experience. The score for the Application Rating will be decided by the following table. Note: The above convention is only for computing A.R. If the candidate will apply then he/she have to fill the correct marks / CGPA as appearing in the transcript. For the International candidates, GMAT score will be taken instead of CAT score. The GMAT score should be at least 750 and the A.R. will be taken as the table given above. Second Step: In the second step, the final candidates will be selected on the basis of application rating, CAT Score (Domestic Students) / GMAT Score (International Students) and the candidate’s performance in WAT-PI round. The candidates interested in IIT KGP VGSOM MBA 2019 can go through these points for some idea about the WAT-PI round. The candidates will be shortlisted for WAT-PI 2019 on the basis of CAT/GMAT score and overall the Application rating. The detailed information is given in the table above. The selected candidates for WAT-PI will be informed through email. For the shortlisting of students for WAT-PI, there is an overall cut-off. For the general category candidate, the CAT cut-off percentile will be 90. For the other categories, it will be decided as per the government rules. In the final selection of the candidates, WAT-PI will contain 60% of weightage, A.R. will contain 20% and CAT will contain 20% weightage. The IIT KGP VGSOM MBA Result 2019 will be released on April 30, 2019. The candidates will be selected on the basis of the points given above. The candidates who will apply will be shortlisted for the WAT-PI round. The result for the WAT-PI will be sent via email. After the WAT-PI round, the final list of the selected candidates will be based on the WAT-PI score, CAT/GMAT score and A.R. The candidates will be able to check the result on the official website as well as the link provided on this page. 1. What is the degree offered by VGSoM?Do we have to choose a specialization in the second year or is it a general MBA? It is a general MBA program. You have the option of choosing electives from Vinod Gupta School of Management as well as other departments in IIT Kharagpur based on your interest. 2. Is there any Scholarship scheme running for the students? There is no scholarship scheme as such. 3. How much is the total fee amount? The current total course fee for the 2-year course is around 10.52 lakh INR. 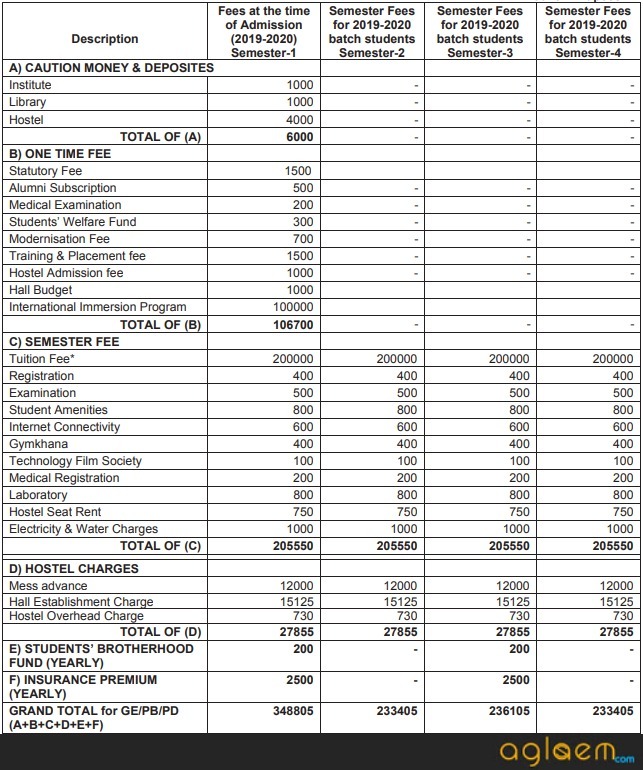 Fees for the MBA programme of four semesters cover tuition fee, international immersion, room rent, teaching materials, library and computer facilities, hostel accommodation, mess charges, and other institutional fees. Please note that both the tuition fee as well as accommodation & mess charges are subject to revision. 4. What is the proposed intake for the Admission Calendar 2019-21? The total number of seats this year is 140. 5. What are the withdrawal and refund policy at VGSoM? The withdrawal and refund will be in accordance and compliance with the rules of IIT Kharagpur which will be notified in due time. 6. Does the college help in getting the loan for fees? No, the Institute does not provide such help in getting a loan for fee payment. Students can choose to avail loan from any bank that they deem suitable. The campus has branches of SBI, PNB, and Syndicate Bank. 7. What all documents do you need for the application process? Scanned copies of mark sheets of 10th std (secondary/matriculation level), 12th std (higher secondary/intermediate level) & graduation certificate. If you are in the final year of a graduation degree program, please upload the provisional certificate. Proof of work experience. If you have work experience certificate from your employer(s), upload it. Else, upload the joining letter and the first & the last pay- slips. Copy of your CAT 2018 scorecard Remember to take a printout of the payment confirmation page for your record. 8. Are calls for WAT/PI given based on profile or only based on CAT scores? Calls would be given on the basis of the CAT score and the overall application rating (AR). Application rating comprises various parameters like prior work-experience and past academic performances. 9. Are there going to be any sectional or overall cut-offs this year? There is an overall cut-off. For General candidates, minimum CAT percentile is 90. This will be relaxed for category students as per Govt. of India norms. Note – Vinod Gupta School of Management, IIT Kharagpur reserves the right to make changes in the shortlisting and Selection Criteria if considered necessary at any point. 10. My extra-curricular achievements are not outstanding. Do I stand a chance? Extra-curricular and personal achievements are not considered during initial shortlisting for WAT-PI. But these may be considered by the interview panel in rating the applicant. While these achievements are always appreciated, absence of these would not deter the chances of admissions as such. 11. Will my request for rescheduling of WAT-PI slot be entertained? Requests for rescheduling of WAT-PI will not be entertained in general. However, in case of emergencies, the candidate can email such request to the Admission Coordinator stating the circumstances under which such rescheduling is being requested. Admission Coordinator will take the decision as to whether such request can be accepted. 12. How does the final selection take place? Candidates for admission to the 2019-21 batch are selected from among the candidates who attend the WAT-PI, with 60% weightage given to WAT-PI, 20 % to Application Rating (AR) and 20% to CAT score at the final stage of selection to arrive at the Aggregate Score. Selection at this stage will strictly be based on ranks on the Aggregate Score. 13. Whom should I contact if I have further questions regarding my application status? ● Prof. Abhijeet Chandra: [email protected]; +91-3222-281780 (Direct), +91-97899-00728.